You are about to ask the love of your life to spend the rest of your lives together. It is a very big deal, and it is a moment that both of you will cherish for the rest of your lives. Therefore, it is important that you do it right and with the right ring! However, buying an engagement ring is not done in one easy step – just think about it! Where should you start? Although the internet is a great place to start, it will not provide you with everything you need to know and the information can be quite complicated and misleading. You should be asking yourself “Do I know where the value is?” “Do I understand the distinction of the different laboratory certified diamonds?” “How do I know what I am getting if I don’t see the diamond in person” The truth is, with online shopping you don’t know what you are getting! You need one person with all the knowledge on engagement rings and diamonds who you can trust completely and who can provide you with a stress-free, personal, and fun experience. It is important to find a jeweler that is local so you can actually see and touch the diamonds and the rings, has a large selection of inventory to view from, owns the GIA certified loose diamonds in their inventory and will not be undersold. Look no further! With over 35 years of experience working with clients and suppliers, Britton Diamonds has built a solid reputation as the premier designer for fine quality diamond jewellery. We specialize in diamond engagement rings and have a large selection of engagement rings and GIA certified loose diamonds. All engagement rings are uniquely designed for each client and are made in Metro Vancouver. All Diamonds are conflict free and as a member of the Canadian Jewellers Association, we adhere to a straight code of ethics. We have a passion for fine diamond jewelry and a focus on diamond engagement rings and wedding bands. Our biggest focus, however, is you! This is what a few of our customers had to say about their engagement ring purchases at Britton Diamonds. “My fiancé loves her engagement ring! We really wanted something unique and meaningful, so Renee and Carlos worked with our ideas to create a custom design that’s truly special to us.” AJ M.
“Couldn’t be happier! I was on the hunt for an engagement ring that I knew would mean a lot to my (then) girlfriend (yep, she said yes!) and also to me. I had been in the market for 5 months and was never satisfied with what I was finding and the service I was getting…..Thanks again for everything Britton Diamonds! You have gained life time customers!” Tanner A. We understand there is a lot of information you need to know, and we’re here to educate you! Not only that, we make sure that you get the exact ring you want, when you want it and within your budget. You will be taken care of before, during and after your purchase. Whether you’re looking for your perfect engagement ring or ready to create a custom design of your own, Britton Diamonds is the right place for all of your needs. So when you’re ready to get engaged start your diamond education with Britton Diamonds. We will provide you with the best price GIA certified diamonds. Give us a call to schedule a free private consultation or email us. Britton Diamonds is a hidden gem of a store. Renee is a warm and funny woman and I felt very comfortable with her. The pieces she has are exquisite and you can definitely tell she takes pride in everything her store offers. I can't wait to pick up my custom jewelry! Honestly the best! I was very nervous about everything and once I saw Renee, I was completely at ease. Her kindness, professionalism and knowledge was both comforting and reassuring. I’m 31 and cannot believe that people get engaged without having a nervous breakdown! Thank you! 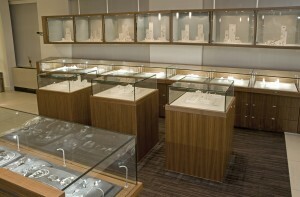 Britton Diamonds is open Monday to Friday from 10:00 am to 5:30 pm and on Saturday by appointment only. Closed on Sunday and Holidays.